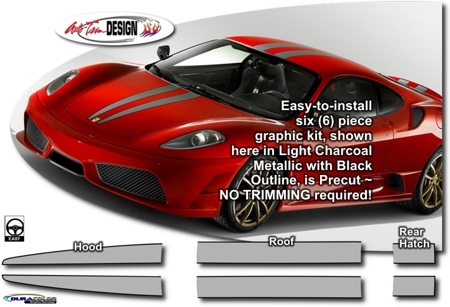 Set your '04-'09 Ferrari F430 apart from the rest with this great-looking six (6) piece Rally Graphic Kit! Kit is PRECUT and ready to install in one of nine (9) color combinations - NO TRIMMING* required! This stripe package is not just straight strips in a box. Our graphic kit consists of prefitted and contoured pieces as shown in the illustration. Kit is specifically made for '04-'09 Ferrari F430 Coupe or Spider factory hood, roof and rear deck areas and will not fit any other vehicle. Pattern of Simulated Carbon Fiber used for some of the Color Combination options is the same as our ATD-GRPHPNL001 - Simulated Carbon Fiber Wrap Film shown on the Standard Color Chart. "Red and Green with Black Outline" color combination consists of Left side Stripes in Red and Right side Stripes in Green - all with Black Outline. *Spider models of the F430 have not yet been fitted for this particular kit. Thus, slight trimming is required for Mid and Rear Hatch pieces as they have been left longer than required for proper fitment.